1. Give, Afford, Yield : دینا : (verb) be the cause or source of. 2. Give, Spring, Springiness : لچک : (noun) the elasticity of something that can be stretched and returns to its original length. 3. Give, Have, Hold, Make, Throw : منقد کرنا - انعقاد کرنا : (verb) organize or be responsible for. 4. Give, Gift, Present : تحفہ دینا : (verb) give as a present; make a gift of. 5. Give, Yield : دلانا : (verb) cause to happen or be responsible for. 6. Give, Devote, Pay : نذر کرنا - دینا : (verb) dedicate. 7. Give, Generate, Render, Return, Yield : دینا : (verb) give or supply. 8. 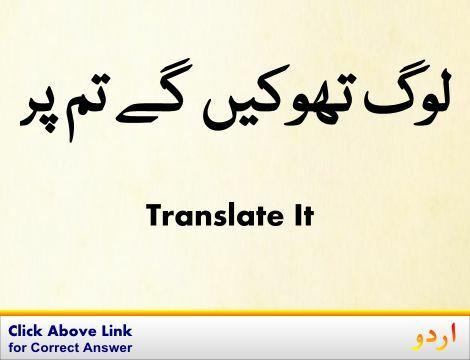 Give, Impart, Leave, Pass On : معلومات مہیا کرنا : (verb) transmit (knowledge or skills). Give a secret to the Russians. 9. Give, Sacrifice : نذر کرنا - قربانی دینا : (verb) endure the loss of. Devote, Give, Pay - dedicate. 10. Give, Hand, Pass, Pass On, Reach, Turn Over : پکڑانا : (verb) place into the hands or custody of. 11. Give, Commit, Consecrate, Dedicate, Devote : وقف کرنا - مختص کرنا : (verb) give entirely to a specific person, activity, or cause. Give one`s talents to a good cause. Consecrate, Vow - dedicate to a deity by a vow. 12. Give, Apply : دینا : (verb) give or convey physically. Administer, Allot, Deal, Deal Out, Dish Out, Dispense, Distribute, Dole Out, Lot, Mete Out, Parcel Out, Shell Out - administer or bestow, as in small portions. 13. Give, Render : ادا کرنا : (verb) bestow. 14. Give, Feed : خوراک دینا : (verb) give food to. Don`t give the child this tough meat. Dine - give dinner to; host for dinner. 15. Give, Chip In, Contribute, Kick In : چندہ دینا - حصہ ڈالنا : (verb) contribute to some cause. Combine - add together from different sources. 16. Give, Break, Cave In, Collapse, Fall In, Founder, Give Way : گرنا - ٹوٹ جانا : (verb) break down, literally or metaphorically. 17. Give : مہلت دینا : (verb) estimate the duration or outcome of something. 18. Give : سزا دینا : (verb) inflict as a punishment. Give: A Cognitive Linguistic Study. Give Away : مخبری کرنا : give away information about somebody. Girlish : لڑکیوں کی طرح : befitting or characteristic of a young girl. How this page explains Give ? It helps you understand the word Give with comprehensive detail, no other web page in our knowledge can explain Give better than this page. The page not only provides Urdu meaning of Give but also gives extensive definition in English language. The definition of Give is followed by practically usable example sentences which allow you to construct you own sentences based on it. You can also find multiple synonyms or similar words on the right of Give. All of this may seem less if you are unable to learn exact pronunciation of Give, so we have embedded mp3 recording of native Englishman, simply click on speaker icon and listen how English speaking people pronounce Give. We hope this page has helped you understand Give in detail, if you find any mistake on this page, please keep in mind that no human being can be perfect.